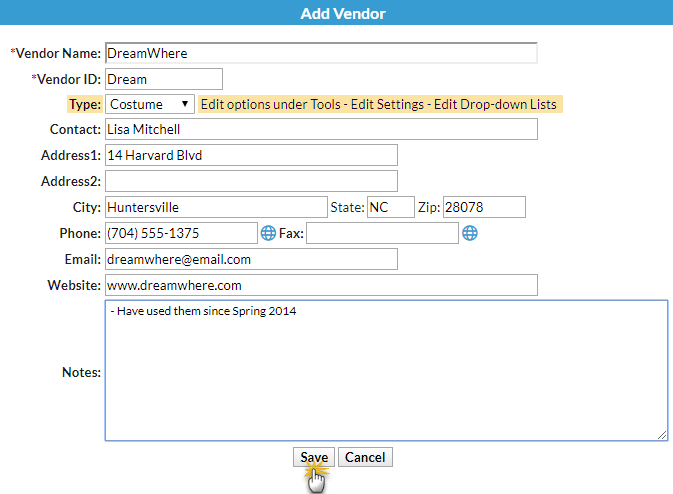 Prior to creating vendors, Add Drop-down Values for Costumes (Apparel) - Vendor Type and Size. Enter the vendors your organization typically uses here. Point to Tools in the menu bar and select Costume Management. Choose Vendors/Size Charts on the left menu. Select Add Vendor to add a new vendor. In the Add Vendor window, enter the vendor details and Save. 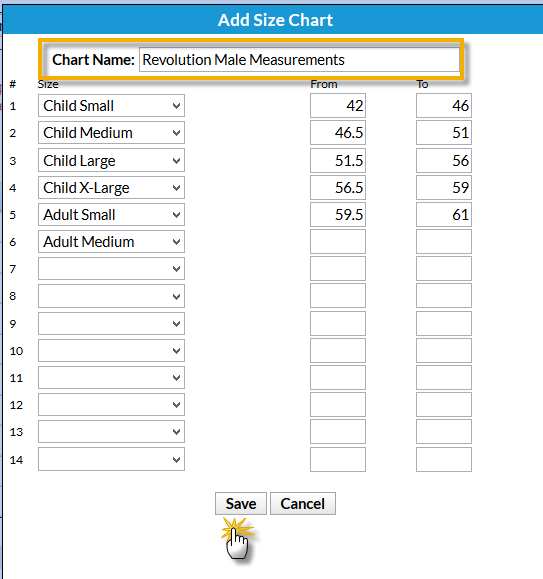 After creating each vendor, add size charts for each vendor's specific sizing standards. Multiple size charts may be created for each vendor as needed. Use the Pencil icon next to the vendor to access the Manage Vendor menu. Click the Add New Chart button. Enter a Chart Name for the size chart. Using the vendor's size chart, enter sizes & girth measurements and Save. Size names (Example: Child X-Small) are created in Tools > Edit Settings > Drop-down Lists. See Add Student Sizes. To add more sizes select the Add Sizes button. Edit a size using the Pencil icon. Delete a size with the Trashcan icon. Filter multiple charts for the same vendor by selecting a chart in the Filter by Chart drop-down list. Rename the size chart by clicking the Rename Chart button. Delete the size chart by selecting the chart to be deleted in the Filter by Chart drop-down list and then clicking the Delete Chart button. Click the Print button to print the Chart. Click Refresh to update the chart after making changes.